Depth, intensity and purity of wine colour. Have the colour evaluated. Try to define its purity and density. Wines are expected to be transparent and have intensive colour. The shade of the colour is in direct dependence on the grape variety. 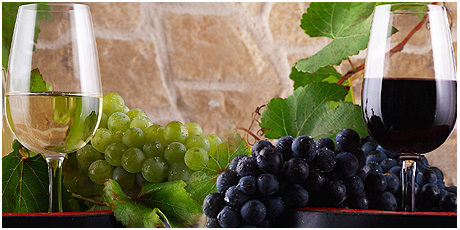 It is the result of contact between grape juice and grape skins during the technological process. The quality of grapes and the winemaking methods used for processing them might be judged by the wine's colour. White wines such as Chardonnay and Sauvignon Blanc might look pale green, with hues of grey, straw-yellow, gold and even brownish. Some sweeter whites like Muscat would usually show deeper yellow shades. Red wines like Cabernet Sauvignon, Merlot or Gamza could be purple or ruby red, brownish-red or brick-brownish. With ageing the colour intensity of red wines would gradually fade and the colour would attain hues of brick-brownish.